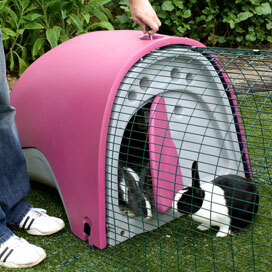 The Eglu Classic Rabbit Hutch offers a complete habitat for your pet rabbit! 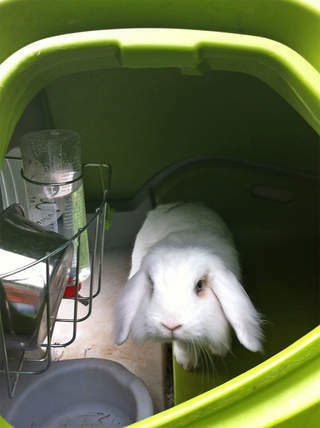 This plastic rabbit hutch is easy to clean and it makes keeping rabbits fun and easy. 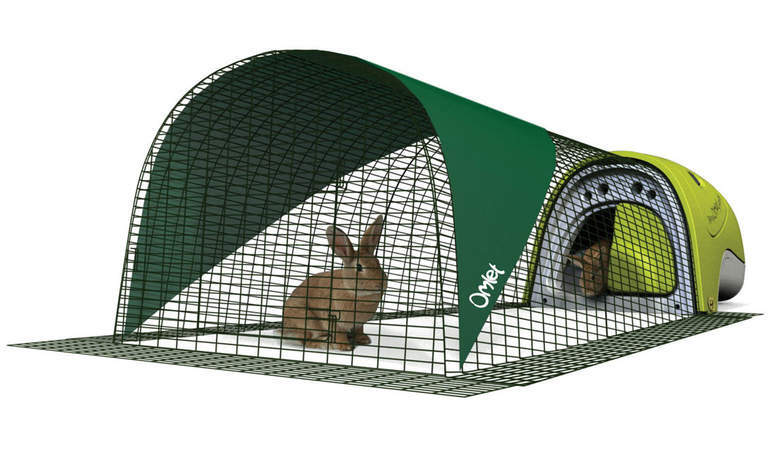 Your rabbits will love their insulated rabbit house and fox-resistant run and they will be able to go in and out as they please. 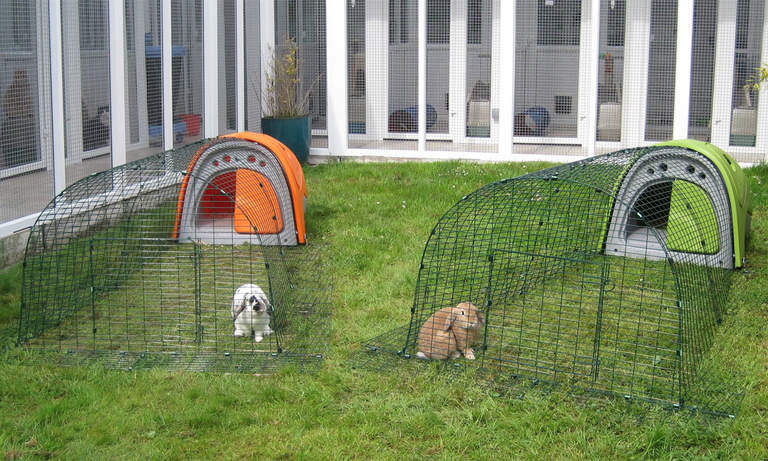 This rabbit house is suitable for keeping two bunnies. The Eglu Classic Rabbit Hutch is the modern, easy to clean and safe home for your favourite furry little friends. 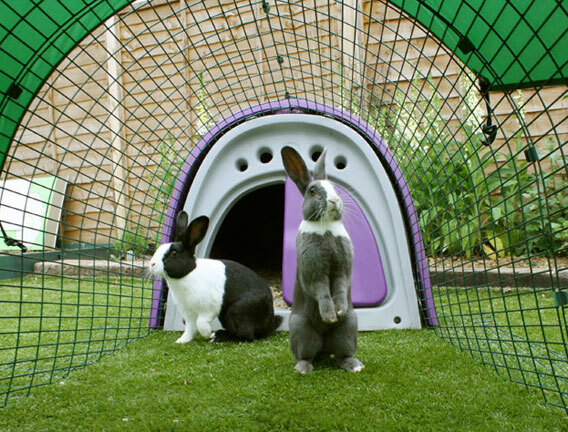 Developed with leading animal behaviourists and thousands of hours of testing, its unique design enables your rabbits to express their natural instincts, making ownership more rewarding and enjoyable. 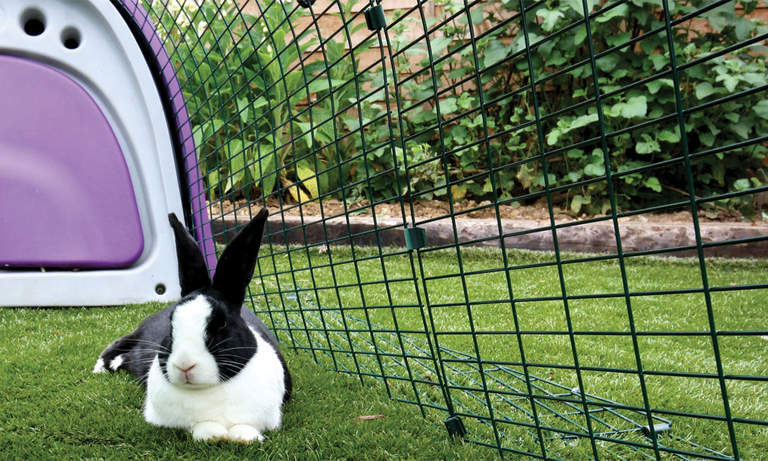 The Eglu Classic Rabbit Hutch's innovative design offers a fun and stimulating environment for rabbits to express their natural instincts. It has two main areas: the house and a secure outside run. 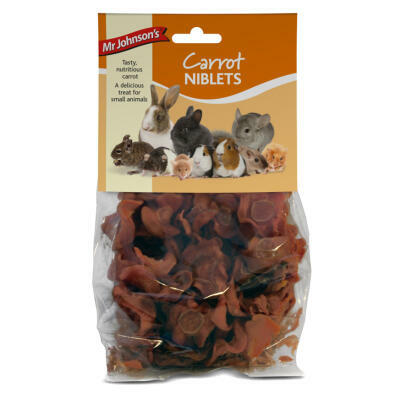 These are available for your rabbits to use at all times, so they can exercise, relax and feed according to their own routines, going in and out as they please. 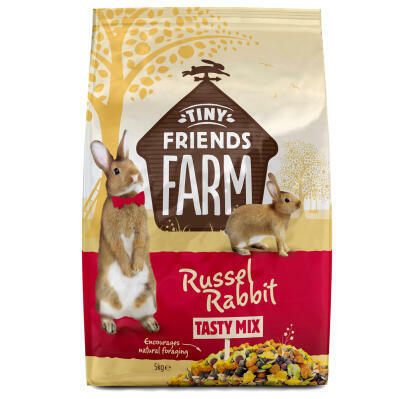 The perfect ingredients for a happy bunny! 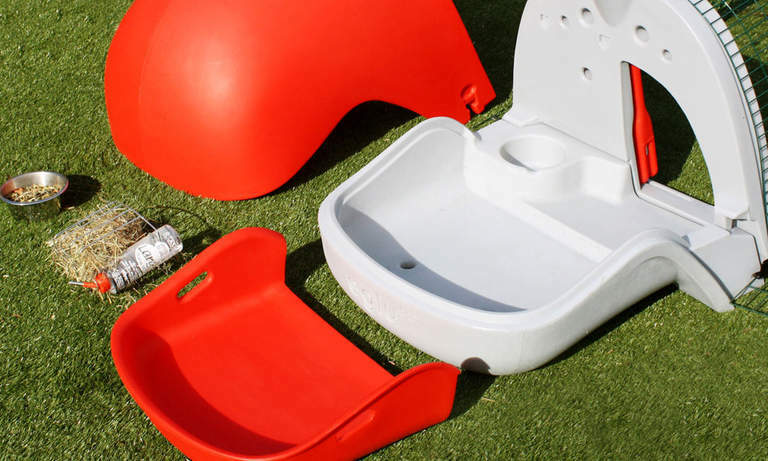 Routine upkeep of the Rabbit Eglu is a simple task thanks to the removable bedding tray and lid, and, made from energy-efficient polymers, it never needs to be treated. The Eglu Rabbit House is naturally weather resistant, it will last for years, and at the end of its life it can even be recycled. 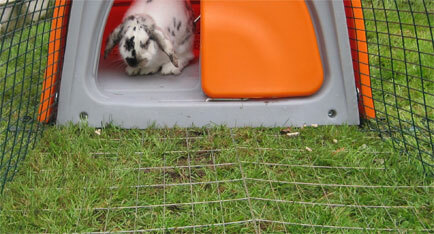 You'll find the Eglu Classic Rabbit Hutch quick and easy to clean. Its smooth surfaces do not absorb moisture, and with no tricky corners where dirt can build up you can simply wipe them clean. 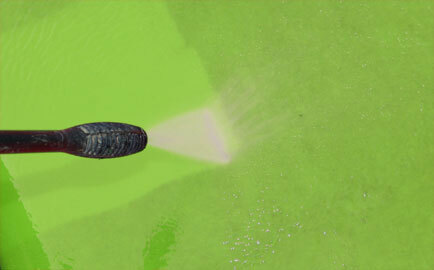 For a deep clean, simply remove the lid and rinse with a hose or pressure washer. 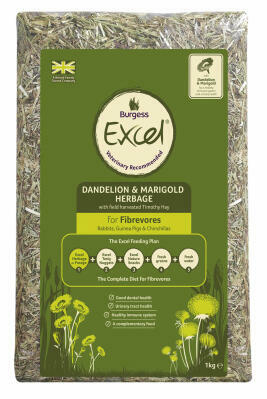 Our removable tray makes changing the bedding a doddle, and the droppings make great fertiliser for your plants. 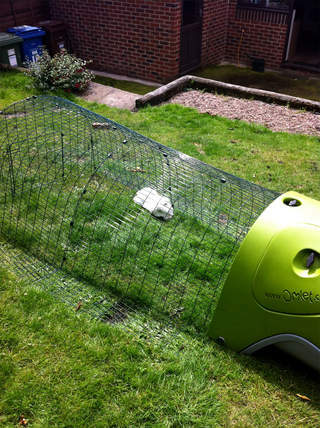 Your garden will look great, and even after years of use the Eglu will still look like new. 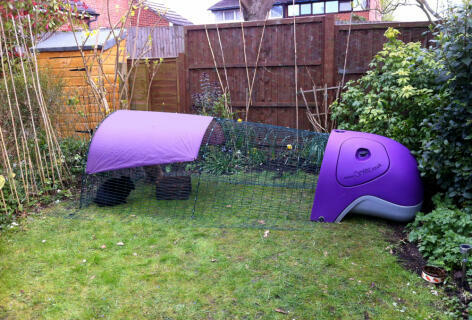 The Fox Resistant Rabbit Run! The optional (yet recommended) 2m run is made from strong steel welded mesh, virtually impossible for predators to break. 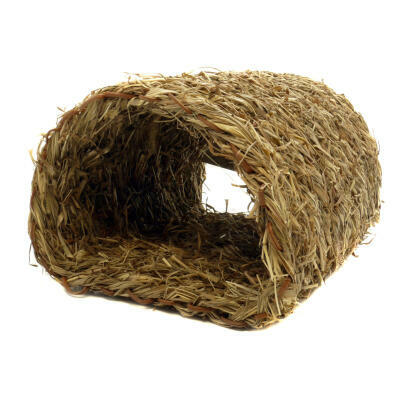 A unique anti-tunnel skirt sits flat on the ground and prevents animals from digging in. 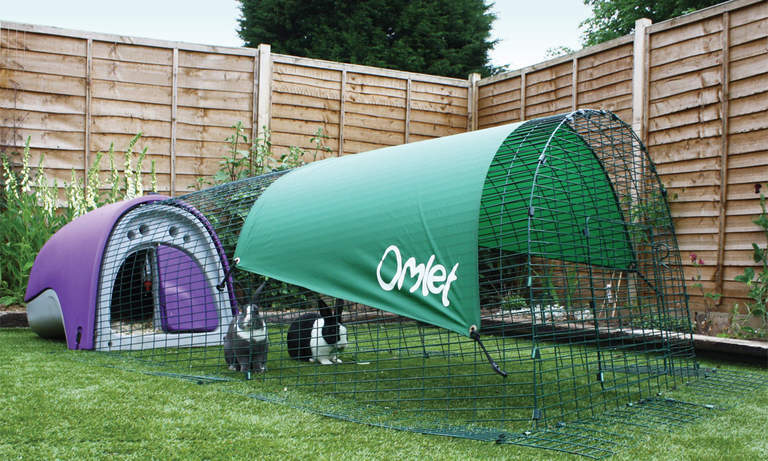 The run offers a huge space for your rabbits to play in and with a height of 80cm it has plenty of room for them to stand upright. You can extend the run in 1m sections if you wish, making the run as long as you like. 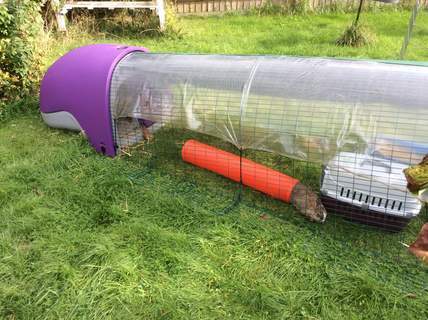 The unique tunnel-proof panels have been proven in rigorous testing to be fox and badger resistant. 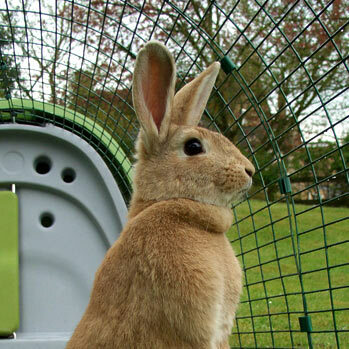 The run means that when you are out and about you can be sure that your rabbits are safe. 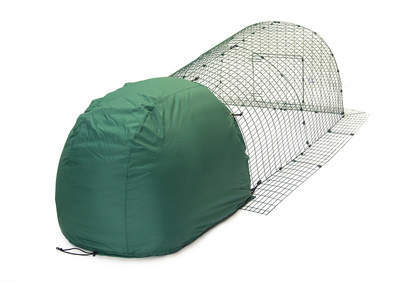 The dark green coating is designed to let the run blend into your garden and is fully bonded to the steel mesh, ensuring an extremely durable finish that looks great. 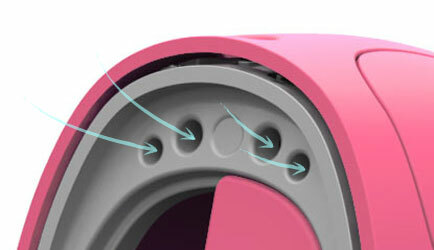 The run comes in sections for easy transportation or storage and can be assembled in minutes. You can use the door in the end of the run to stroke your rabbits, feed them and lift them up to groom them. 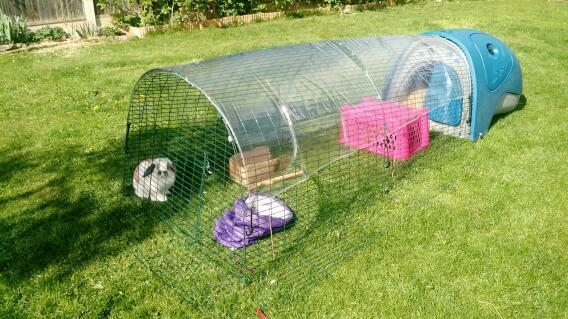 The Run can also be attached to our Walk in Run to make it even larger for your rabbits. 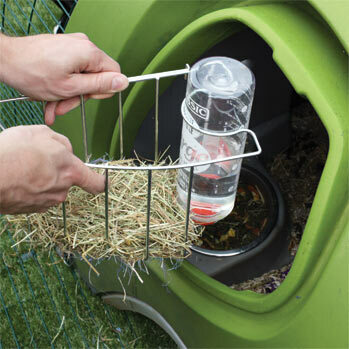 The hay rack, feed bowl and water bottle are mounted inside the Eglu Rabbit House and can be conveniently refilled through the side door. Rabbits are herbivores and hay should form the main part of their diet. The hay rack holds enough hay to keep two medium sized rabbits well fed, and the stainless steel dish is handy for filling with pellets and crunchy vegetables. Having the water inside the house means it is protected from direct sunlight, reducing algae formation in the bottle, and it will be insulated by the house, reducing the chance of freezing during winter. Hay, food and water makes a happy bunny! 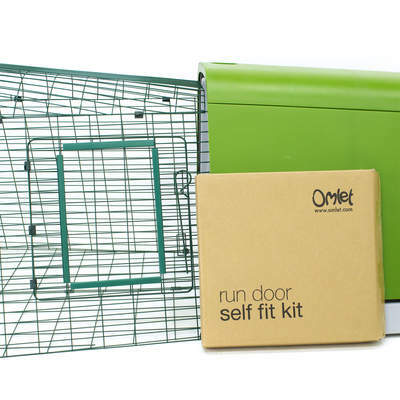 Use the front door to separate the house from the run, this is useful if you are cleaning or need to catch a rabbit to move or take to the vets. Easy to use, and perfect when you want to keep your rabbits out in the run while you clean the inside of your Eglu or refill their water and food. 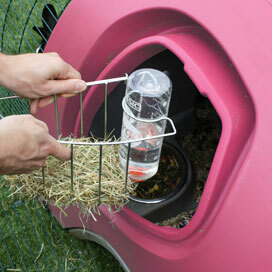 To handle your rabbits or refill their food and water you use the handy side hatch. 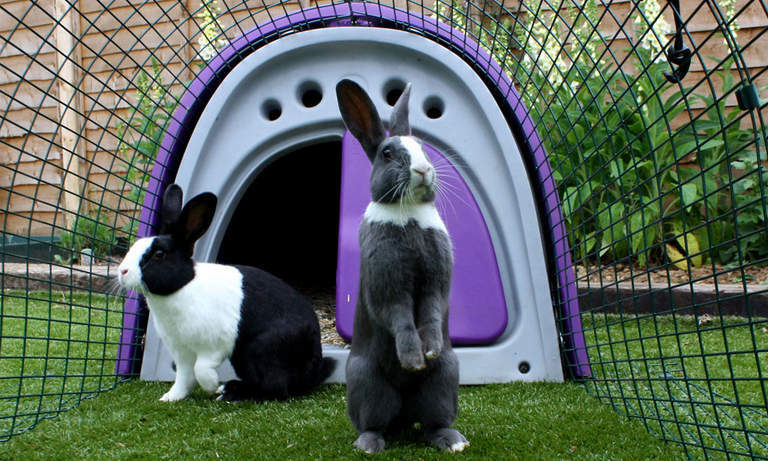 Twin Wall Insulation keeps your rabbits cool in the summer, and warm in the winter! 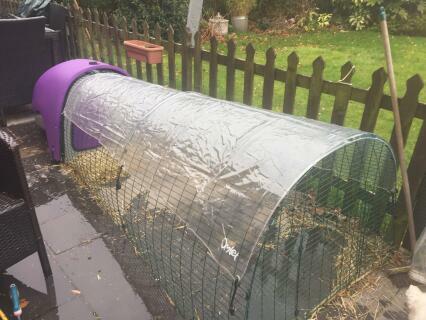 The Eglu is specially designed to keep your rabbits warm in winter. 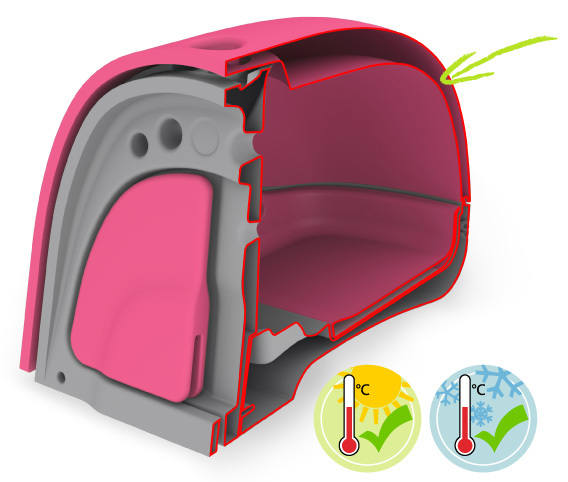 The Eglu has a unique twin-wall insulation system which works in a similar way to double glazing trapping a pocket of air which provides a very effective means of insulating the house. 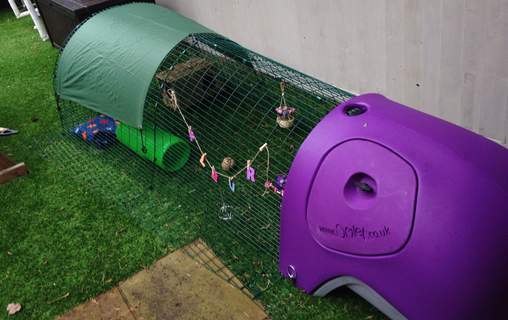 In summer your rabbits will be kept cool by the Eglu's draught-free ventilation system, carefully designed to avoid air blowing directly over the bedding area whilst allowing fresh air to circulate. When you buy an Eglu you also get over £25 worth of accessories absolutely free! Not only that, we’re so confident you’ll love everything about the Eglu Rabbit House that we offer a 30-day, no-quibble money-back guarantee. 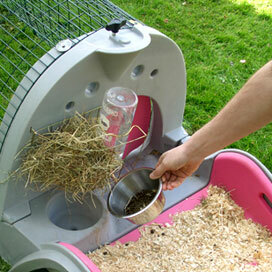 Bespoke fitting hay rack for your Eglu which holds the hay securely and keeps it away from their bedding. 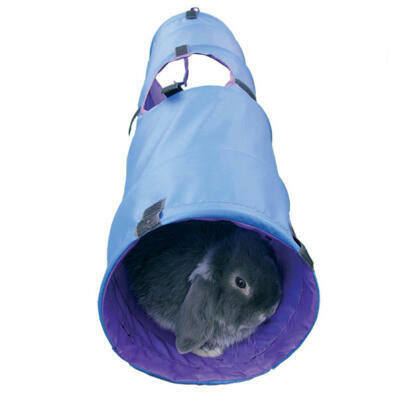 With 600ml water capacity, the water bottle will keep your rabbit’s thirst quenched all day long! 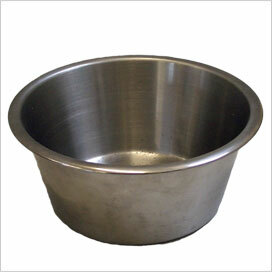 A handy bowl that you can take back to the kitchen to fill with crunchy vegetables for your rabbits to gnaw on. 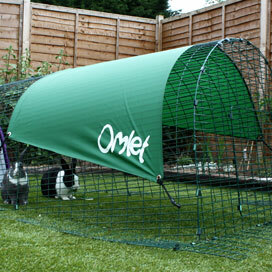 This all weather shade attaches to the run and will protect your rabbits from wind and rain. What’s more in summer this useful shade provides a cool area outside. (This shade comes free only if you are buying an Eglu with run). 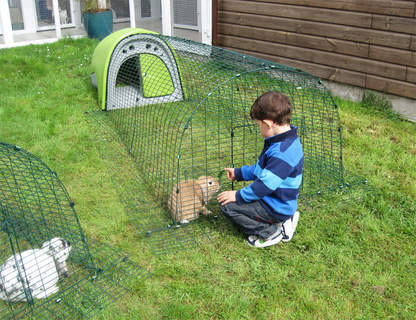 Rabbits make wonderful pets and the Eglu Classic Rabbit Hutch makes keeping them fun and easy. Happy pets and happy owners all round! If for any reason you are not entirely satisfied with the Eglu you can send it back to us for a full refund. This does not affect your statutory rights. 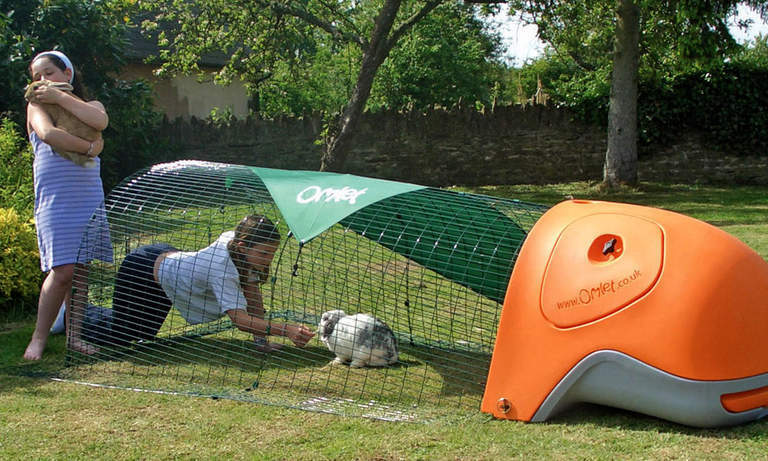 The Rabbit Eglu will look great in your garden! 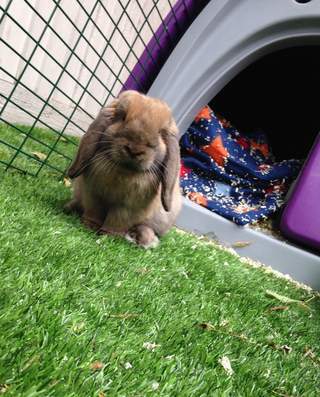 Although grass is great for rabbits, it is possible to keep bunnies if you don't have a lawn. You can keep the Eglu on a patio area, but you should provide them with a deep sand box to dig in. 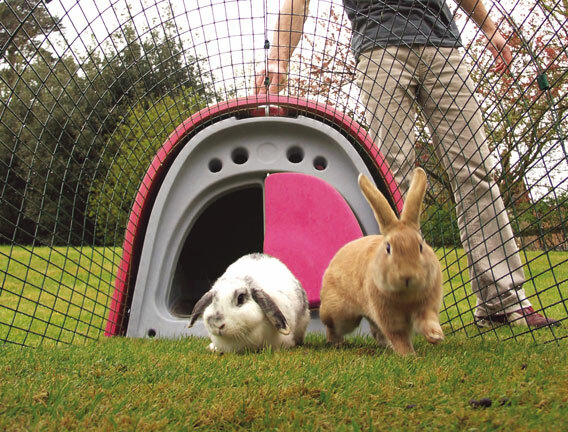 The Eglu Rabbit House is suitable for two medium sized rabbits, such as an English Lop. 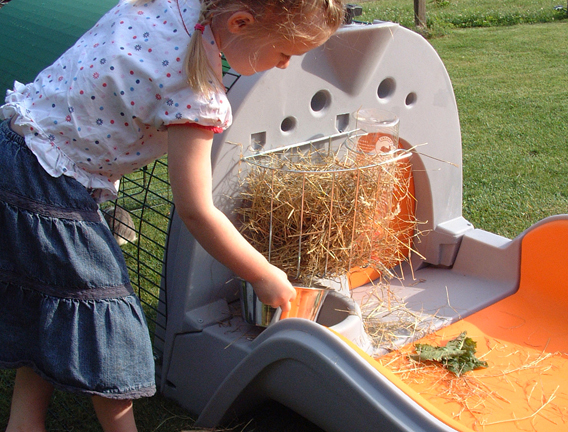 I recently found my original order for my orange classic eglu, and could not quite believe it was dated 11 years ago! it was bought as a Rablu, then changed to an eglu over the years, but it has been in permanent use for 11 years and is still working well. At the time we thought it was an expensive treat, but it's worked out loads cheaper than wooden equivalents and still looks a fantastic feature in the garden. 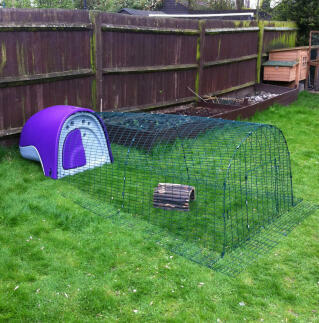 Purchased a blue 10 year old + classic from eBay to summer board the school rabbits...the eglu really has stood the test of time. Yes it's faded a little and the runs a little bit rusty in the odd place, but the integrity of the structure is good as new. It's far, far easier to clean out than a wooden hutch for a start and the need for the consumables has decreased significantly. Was nervous about leaving the eglu door open on the 1st night, but have full confidence the rabbits are safe day and night. Fortunate to live close to Omlets head office so popped in for a new cover and screw pegs, which are amazing if you've been using tent pegs instead!! Yes an Eglu is dearer than a wooden combo but that's far outweighed by the longevity of the product and the option to resell when it's no longer needed. 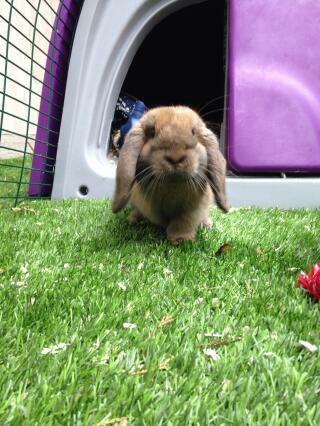 Add on the quality of life and natural habits of a rabbit and I wish we'd bought 1 from new in the 1st place. we have two eglus and worth every penny !! Wooden hutches are a waste of time and need replacing often so better invest in one of these fantastic easy clean eglu's. 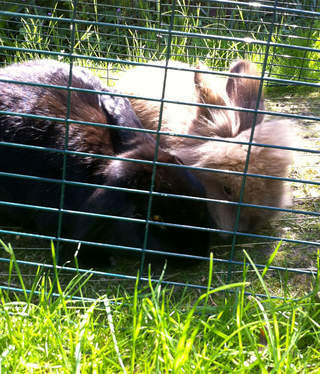 And if you give up keeping rabbits you still get a good price selling second hand on ebay! I thought that I should write a review after reading everyone's reviews. 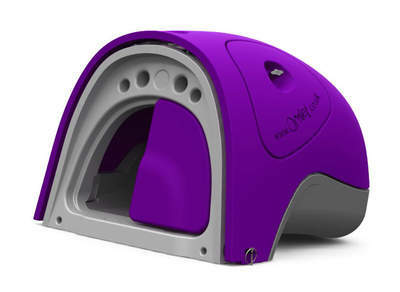 This is a fantastic product and I know that there have been comments that it is slightly pricy but don't let this put you off.we have had our Eglu for 8 years. 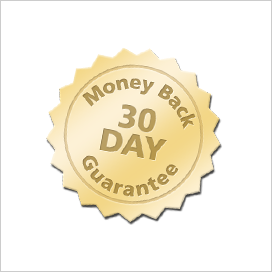 It is great quality and I couldn't recommend this product more. 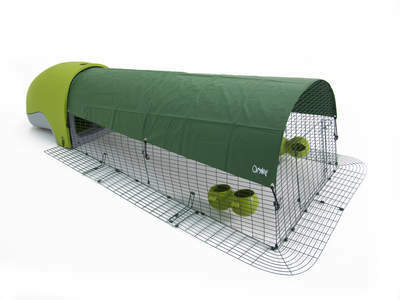 Don't bother with a wooden hutch this will be the best home ever for your Guinea pigs or rabbits.